You can click here to sign up online. Simply fill out the online form and your account will be activated automatically. There is no membership fee or annual renewal fee. How soon will my package be delivered to my front door in Trinidad? Upon your package arriving at our Miami facility, it is sent to Trinidad within 24-48 hours. Local deliveries are performed within 1-2 business days after the cargo is cleared. Delivery to remote locations (including but not limited to: Toco, Manzanilla, Mayaro, La Brea, Cedros, Sangre Grande), will be conducted based on a pre-arranged arrangement by both parties. Customers will be required to meet their driver at a mutually convenient location to receive their packages. Unfortunately, we do not currently deliver on Sundays or Public Holidays. Urgent packages can be delivered based on a separate rate and with ample notice. Yes, to have your package(s) delivered at a address which is not the same as the registered delivery address on our database, please email us logistics@shipbluesky.com with the relevant instructions and address at 3:00pm on the preceding delivery date. You can also request a permanent change of delivery address via email to logistics@shipbluesky.com. We would like to offer this convenience to all our customers. However, due to the potential risks, we are unable to deliver in the areas below. Also, we do not deliver to some areas which are not feasible for us based on the distance. We invite customers in these areas to contact us for alternative delivery arrangements. During check out the online vendor requests a telephone number. Should I provide the number for your Miami Warehouse? If I receive an incorrect or damaged item, can I return it to the USA using Blue Sky Shipping? Yes, you can. You must contact your supplier/vendor and inform them you want to return an item(s). They will provide a return label to stick on the package you wish to exchange. The item must be repackaged properly and returned to our local office. We will ship it to Miami and return it to your supplier/vendor on your behalf. The cost is calculated based on the size and weight of the item(s). Does Blue Sky Shipping provide insurance for packages and other cargo? Yes, we do. Insurance can be provided on specific items. Insurance is charged at a rate of $1.00 USD per $100 USD value of your package up to USD$300. For items exceeding a value of USD$300, kindly contact us and we will guide you accordingly on our insurance rates. Please note, our insurance rates and services are subject to change without notice. How do I calculate an estimated cost of shipping my packages? Click here to use our air freight shipping fee calculator. Click here to use our sea freight shipping fee calculator. Please note, this is just an estimated cost of shipping your package and not the final charges. Blue Sky Shipping fees are calculated based on the actual weight of items and prices are rounded up to the nearest pound(lb) e.g. a 2.3lb package will attract a 3lb rate. For air freight, we charge actual weight once your cargo/packages fit into our secured cargo bags. Oversized cargo may require repacking at client’s cost. Kindly contact our office for charges on excessively bulky items. Can I collect my packages at the Blue Sky Shipping Ltd office? Yes, you certainly can. If you live in an area in which we do not deliver to or if you prefer to, you may collect your packages at our Blue Sky Shipping which is located in Chaguanas, opposite Medford gas station. If you wish to collect the package(s) at our local office, please advise us via email to logistics@shipbluesky.com within 24 hours prior to delivery. How do I shop online if I do not know or do not own a credit card? Once the price is agreeable to you, please email the links of the relevant item(s) to _____________________. After that, a 75% downpayment of the total cost is required prior to us ordering the item(s). You can make this payment at any Scotia Bank or First Citizens Bank location directly to our company account. Are there any restricted/prohibited items? Yes, there are certain items which are prohibited by law from being shipped via air or sea freight. Please, click here for a detailed list of restricted/prohibited items that cannot be shipped with Blue Sky Shipping Ltd. Items considered to be Dangerous Goods by the FAA will be put on hold in Miami and will not be sent until we receive further instructions from you and all appropriate paper work has been filed and fees paid. These items include all aerosol cans and hazardous chemicals. Please note that shipping hazardous materials will result in holding of the items in the Miami warehouse. Customers shipping hazardous items will not be entitled to a refund nor will it be delivered to them. Do you offer a mail/magazine delivery service? Currently we do not ship mail, however magazines are permitted. This is because of the large amount of junk mail that is received at our Miami office from various online merchants. If you have a specific document or magazine subscription you wish to send through your Blue Sky Shipping Box, please feel free to do so. We accept cash (US$ or TT$), direct deposits, debit, or credit card payments via LINX. We are unable to accept cheque payments unless, they are certified cheques. 1. Complete and sign our Credit Card Authorization form. 2. Scan or photograph only the front of your credit card. 3. Scan or photograph the back and front of your National ID card or Driver’s Permit. All cards submitted must be valid i.e. non-expired. Once the above items are received, we will confirm receipt and acceptance within one business day. Can't use your local billing address at some websites in the USA? Don’t worry, you can still shop at these websites. Just ask your bank to add your Blue Sky Shipping Ltd address as an auxiliary billing address to your credit card. This will speed up your checkout process since your billing and shipping address will be identical. What charges will be included on my invoice? Your invoice will include: Freight, Custom Duties (if applicable), VAT charged by Customs & Excise (if applicable), Fuel surcharge, Insurance fee and Handling fee. Is there a limit to the size/weight of the packages I can ship? There is no limit to the actual weight or size. Essentially our carrier has stated that if it can fit in the flight, we can bring it to you. For heavy and/or oversized cargo, feel free to contact us for further assistance. We are equipped to handle large bulk items in our warehouse, thus commercial shipments are welcome. The weight from my supplier does not match the weight from Blue Sky Shipping . Why is this? 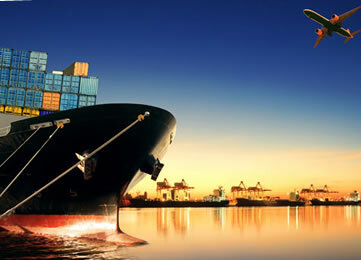 Yes, we offer cargo consolidation for our air and ocean freight services at no additional cost. For extremely bulky items, kindly contact our local office for further information. Yes, you can track your packages from our Miami warehouse to your front door on our website using your Blue Sky Shipping customer number (this is your username) and password. Visit our website and use your login information to track your packages from our Miami warehouse to your front door. Do you send pre-alert notification emails? Yes, we do. As soon as your package(s) arrive to our Miami facility, you receive a notification email from our logistics’ team. Do you send emails advising on the delivery date/time? Yes, we advise all our valued customers that they drivers will be in their area to deliver their package(s). The invoices are emailed to the customers. Normal opening and delivery hours for our Trinidad office are Monday to Friday, from 9:00 AM to 5:00 PM and Saturdays 9AM to 1PM. Unless otherwise notified, we are closed on all Sundays and Public Holidays. Our Miami Warehouse is open to receive cargo Monday to Friday 8:00 AM to 5:00PM. Due to their extremely high volume of parcels, the United States Postal Service is unable to individually verify the status of every delivery. Therefore their records of your package being delivered to our warehouse most of times is incorrect. Blue Sky Shipping Ltd is not liable for any delays for packages shipped via USPS. I got a tracking number from another delivery agent in the USA, but my package is still delayed. Why is this happening? Your complete Blue Sky Shipping address was not entered during online checkout and the package was delivered to the wrong address. If your item is classified as a Restricted Export by US Customs, it can be detained in Miami pending the necessary documentation and approval. We will assist and advise you in such cases. However, it can be a lengthy and costly process depending on the item. The item was delivered out of business/opening hours. Blue Sky Shipping Ltd is not responsible for any package delayed for the above reasons. However, by Pre-alerting all your packages upon initial purchase, you can help us minimise these types of delays. A fuel surcharge is imposed on all carriers by air freight “only” When customers ship via ocean, they do not have to pay fuel surcharge. Blue Sky Shipping Limited remains committed to serving you our valued customers in the best way possible. Hence, we are keeping our “freight charges” as low as possible.